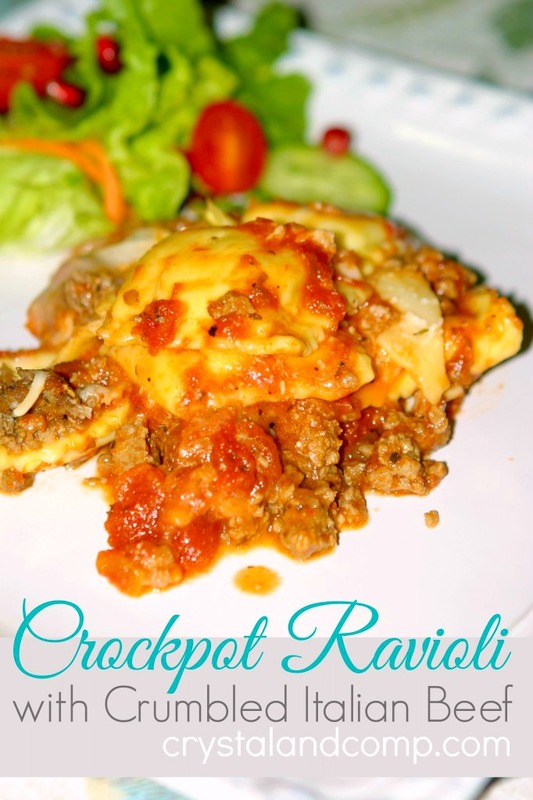 My Crockpot Ravioli recipe is the most popular recipe on my site. It doesn’t hurt that it is easy and my kids love it! I like to make a large batch and have leftovers for those who next it the next day for lunch. It makes for a great hot lunch and that is something I love to do since we homeschool. 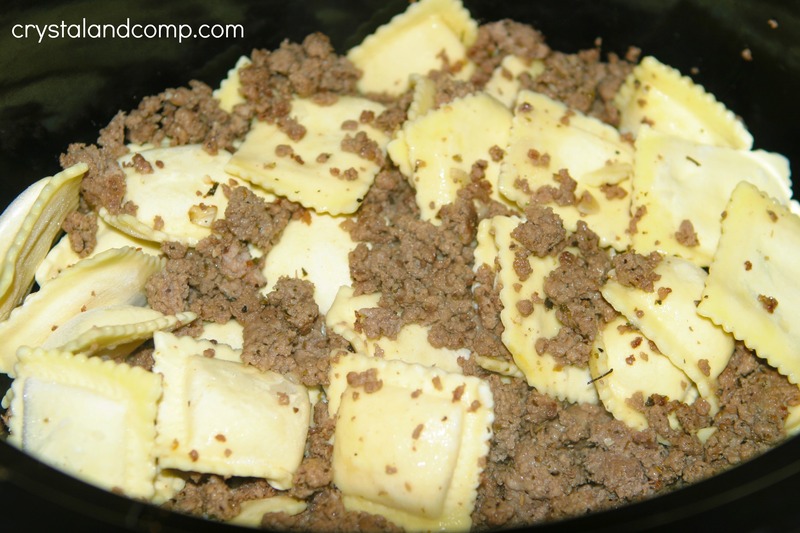 It occurred to me recently that we could have cheese raviolis with hamburger meat added in- like on top of the ravioli. And why no cook the beef in Italian seasoning. Yum! In a skillet add the olive oil and minced garlic over medium heat. Add the hamburger meat. 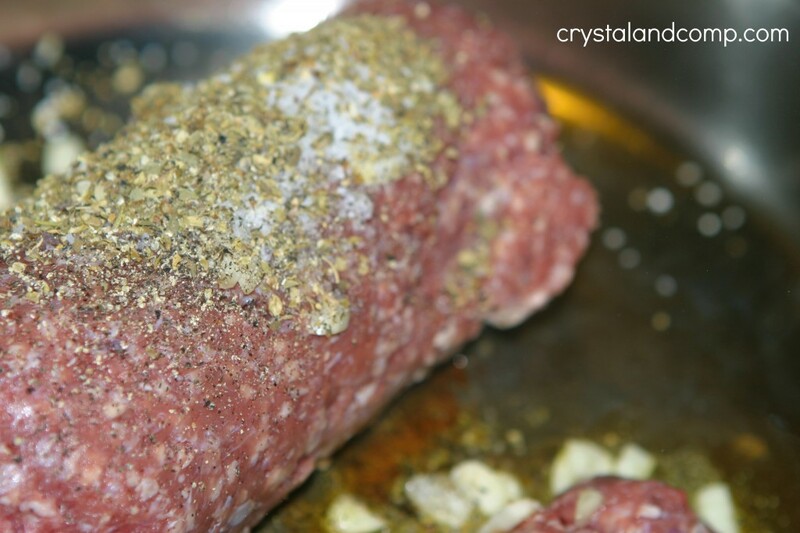 Top the meat with the salt, pepper and Italian seasoning. Cook well over medium heat, crumbling the meat as it browns. Cook until all the meat is browned. Add one bag of the ravioli to the crockpot. Pour half of the cooked beef evenly over the pasta. 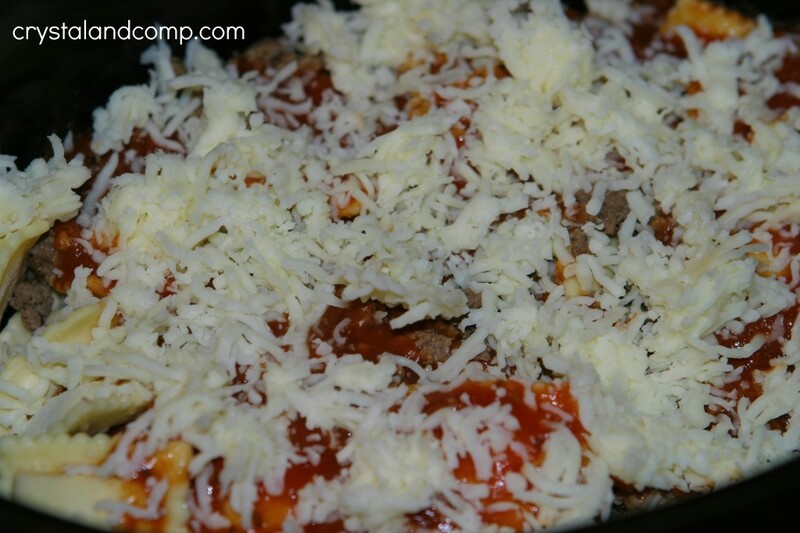 Add one jar of spaghetti sauce evenly over the pasta and beef. 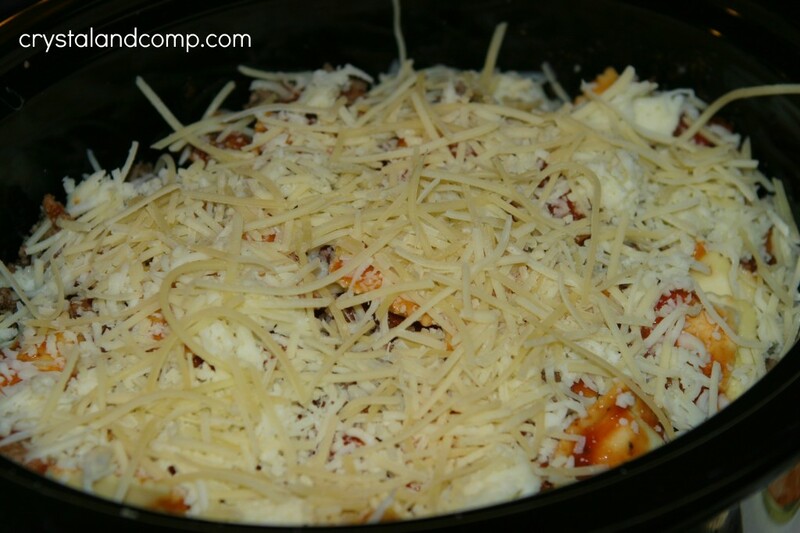 Sprinkle with one cup of the Mozzarella cheese. Again evenly over the dish. Repeat those layers again using up the second bag of Ravioli, the second can of sauce, the remaining beef and the final cup of Mozzarella. Top all of that with the Parmesan cheese. Pop a lid on it and cook for 3 hours on high. This cooks quickly. Once it is done, plate it up. This easily serves 8-10 people. Like I said, we hold on to leftovers for lunch. I served this with a yummy salad, topped with pomegranate seeds. AMAZING! We also had clementine orange slices. Yum! It is super easy and yummy. Perfect for those hungry men who love meat. Don’t want the meat? 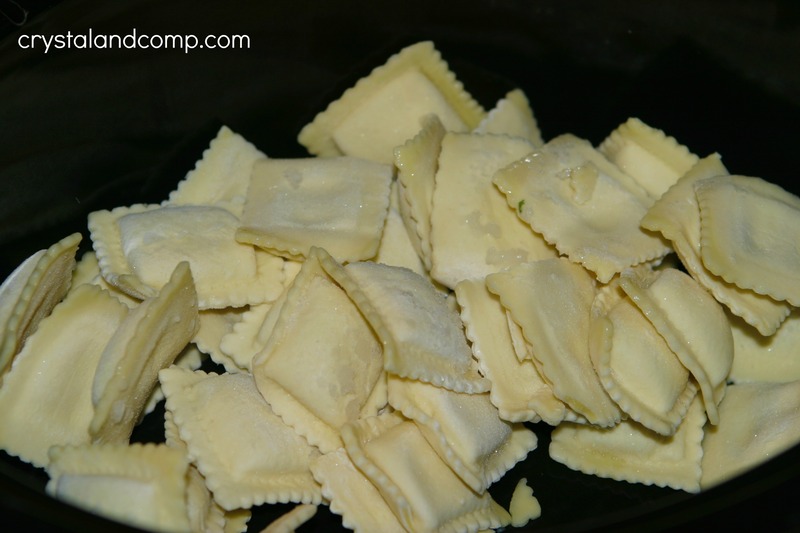 Make my traditional Crockpot Ravioli recipe. Sure wish this was in my Crockpot right now. Thanks so much for sharing with Full Plate Thursday and enjoy your weekend! 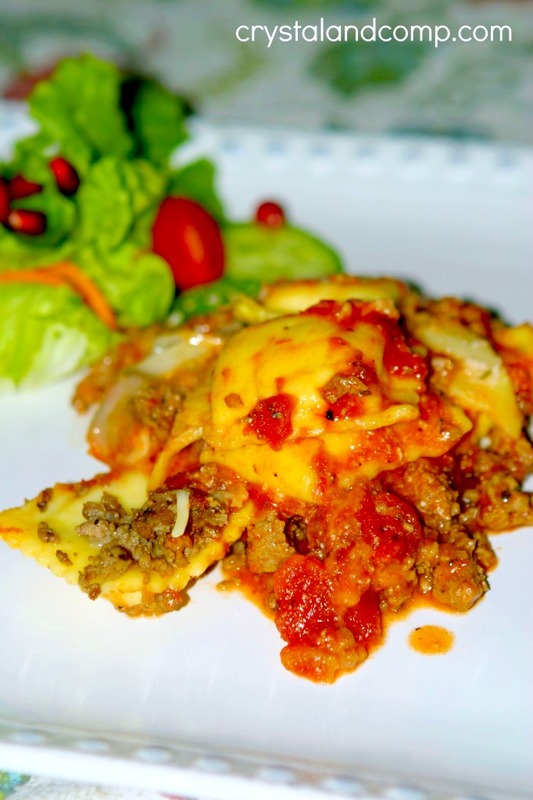 Love slow cooker recipes, but ravioli? Never heard of it but must try. Hopped over from Six Sisters linky. Lori, you’ve gotta try it. Totally awesome! How large of a crockpot do you use? I am wanting to make this. I think my is 6.5 qts and I need to be able to feed 13 people…11 of which is men so in other words plenty of food. I have a 6 qrt oval crockpot. If they are all men I would be tempted to do three bags of ravioli and have a nice salad and some bread on the side. Great minds think alike…Do you think three bags would fit in the 6 qt or would I need a second one. I need to be able to transport this from home to work. This sounds amazing Crystal! Adding it to my menu plan! Does this recipe use 50 ounces of frozen ravioli, or was 25 ounces the total amount? You will use 2 of the 25 ounce bags. Could you cook this on low to extend the cooking time? Even frozen and on low, it will cook in 4 hours. This cooks pretty fast.